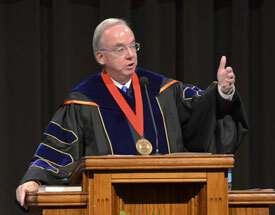 LifeWay Christian Resources President Thom Rainer announced Sept. 13 that Union University President David S. Dockery is the recipient of the second Holman Christian Standard Bible Award, the highest honor that LifeWay bestows. Rainer, speaking at a chapel service in Union’s G.M. Savage Memorial Chapel, read a letter from Selma Wilson, president of LifeWay’s B&H Publishing, in which she told him of the HCSB Award committee’s decision. The first HCSB Award was given posthumously in 2009 to Fred Winters, pastor of First Baptist Church in Maryville, Ill., who was shot and killed during a worship service. Wilson said the award committee “recently evaluated several incredible leaders” as potential recipients of the HCSB Award, but that Dockery’s name rose to the top. The recognition comes with an HCSB Bible, a plaque and a monetary award. LifeWay will formally present Dockery with the award during the Southern Baptist Convention’s annual meeting in Baltimore in June.